Reggae music fans the world over make the pilgrimage to the famed singer/songwriter's grave site at the village of Nine Mile, where Marley was born. 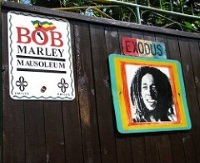 The two-room shack in which he lived is open to view as a sort of museum and memorial, filled with memorabilia, and alongside it is the mausoleum in which Marley and his half-brother are buried. Visitors can sit on Marley's meditation spot, resting their heads on the rock 'pillow' he mentions in his song lyrics. The site also has a vegetarian restaurant and small shop. Reggae concerts are held at Nine Mile each year on 6 February, Marley's birthday. Many tourists in Jamaica miss out on the beauty of the rural, inland regions because they tend to stick to the coast, so this excursion is also a great way to explore the lovely scenery around Nine Mile and Mount Zion.